View More In Bottled & Canned Coffee Drinks. Since 1987, our thick-it team including speech language pathologists, registered dietitians and scientists has been dedicated to finding reliable dysphagia nutrition solutions for people with swallowing difficulties and their caregivers. To us, it's personal -many members of the thick-it brand team have loved ones, friends or patients affected by swallowing difficulties and understand the challenges. Thick-it original instant food thickener was the first healthcare food thickener on the market, and is now the number one-selling retail powdered food thickener in America. 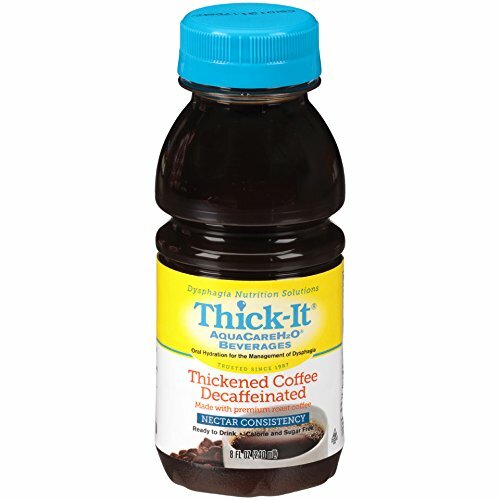 Today, the thick-it brand has expanded to include delicious ready-to-drink beverages and ready-to-eat purees, designed to simplify your life by providing convenient and effective dysphagia nutrition solutions. The thick-it brand is owned by kent precision foods group, inc, a privately held dry-blending and packaging food company dedicated to improving the quality of life for people with swallowing problems and their caregivers. These thickened beverages are ready-to-drink; making for a no hassle dysphagia food. Can be heated, chilled and frozen without losing thickness. Thick-It AquaCare H2O pre thickened drinks have re-sealable bottles that are perfect for use at home or while traveling. Ready-to-drink and made with a premium roast blend, our thickened coffee decaffeinated has a smooth rich flavor you love with no caffeine, calories, sugar or carbohydrates. If you have any questions about this product by Thick-It, contact us by completing and submitting the form below. If you are looking for a specif part number, please include it with your message.